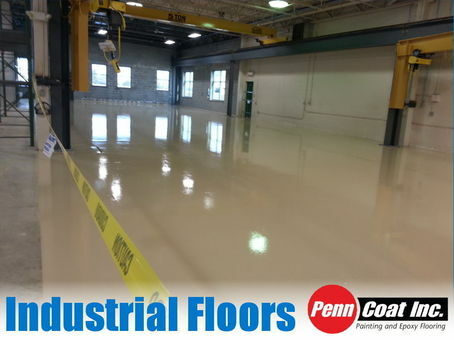 This past fall, PennCoat, Inc. was contacted by an engineering firm to install 6000 sqaure feet of epoxy flooring. The engineering firm was expanding their operation into a part of the building that they hadn't used. They wanted to protect their concrete from the manufacturing, and decided that an epoxy coating was the best course of action. Out of the options we offered, they elected a 16mil epoxy flooring system with a coefficient friction of 0.7. First step was to prep the floor. We used a planetary grinder to clean the floor, and remove any existing coating that was left from previous installs. After the floor was ground, we had to patch the joints and the divots to prepare the floor for the epoxy. After the floor was prepared and patched, we installed the 1st coat at 8mil. Then, after letting the first coat cure overnight, we installed a 2nd coat at 8mil as a top coat. The final product was a beige floor that was intended to protect the concrete from the manufacturing machinery the owners planned on installing into the new production area.